Ryan prepares to watch a game — as only he can. A unique set of circumstances during this holiday break has left me with what may be my longest period out of the office since I graduated from college. It is the result of the holidays falling on Tuesdays, combined with NHL work stoppage, that has made this extended break possible. But the same set of circumstances has prevented us from doing anything particularly elaborate with the time off. Veronica has worked most days while I am home with the kids. That’s not to say the time hasn’t been special. We had a wonderful Christmas Eve and Christmas Day spent in the company of extended and immediate family. And in the days since, we have found ways to pass the time. We have played games together, whether it was new items acquired for Christmas or old favorites. And yesterday, Ryan and I went to a local high school hockey tournament. With no NHL games, it was the best we could do to fill the hockey void. Ryan was initially resistant, but Veronica insisted and we went to a single game last week. We had a great time. Yesterday, we took in a doubleheader. Four hours spent, voluntarily, inside a frigid ice rink. Ryan never complained once, never asked to leave, never hinted he was cold, even as I shivered in my seat. Ryan, being Ryan, doesn’t just watch the games — he logs them. Before we went, he had me look up the schedules and the records of the various teams we would be seeing. He prepared meticulous score sheets on which to record the shots on goal — his favorite statistic. I love the time spent together (although I wish I had dressed a little warmer). Do I wish Ryan would watch the games in a manner more similar to other kids there? Before I read this post, I probably would have said yes. And if I’m being honest, there’s a part of me that still feels that way. I have written many times about the joys of “normal” family outings. But I have also learned to appreciate Ryan’s unique approach to experiencing a game. It is born of a pure love of the sport, tempered by his particular ability to focus on a topic of his liking, and, taken together, it is all his own. It’s part of what makes him, well, him. And I can’t wish that away any more than I can wish he had a different eye color. Autism has its challenges. It throws up barriers to taking in certain experiences. It sometimes makes the simple, difficult. But my son has a way of enveloping himself in an activity that is part of autism too. It makes him happy. 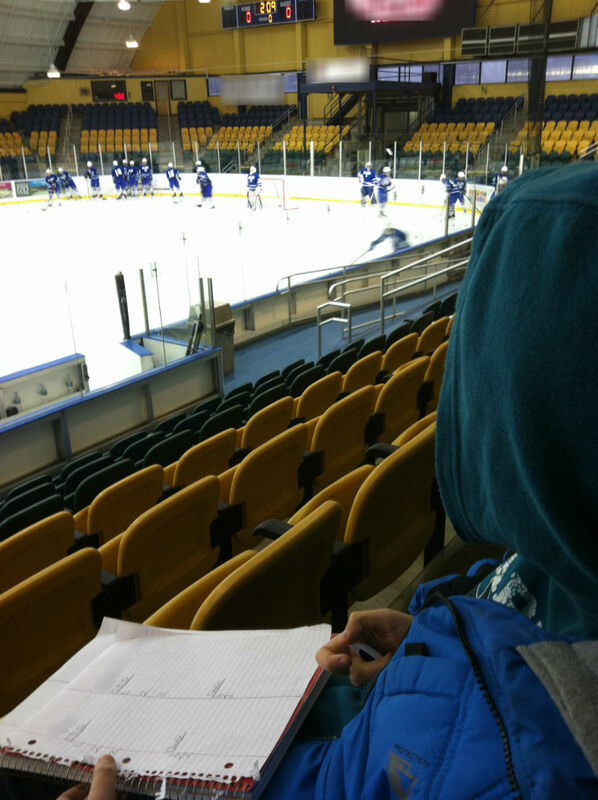 Yesterday, it allowed me to spend four hours, sitting side-by-side with him, helping him tally the shots on goal. There were no distractions. He didn’t allow anything to invade our hockey bubble. That’s a part of autism, too, and one I have to admit I appreciate. The net result? I can’t think of a better way to spend a winter afternoon. I wish I could allow myself to just “be” with a hobby that I truly enjoy. I admire my son’s (and yours) ability to wholeheartedly enjoy something. I admire the manner in which you and Veronica (and Riley, too) can find the best of most all situations. I know that is a challenge beyond anything most parents ever experience. But you both do it with love and respect. I am so proud of you all.